Sometimes being a mum can mean your health, beauty and fitness falls by the wayside as you juggle kids, home, work, exhaustion and everything in between. Let’s face it, some days switching from pyjama pants to yoga pants is about as good as it is going to get. Offspring shares some tips and tricks to make it easier to squeeze some ‘me’ time into your day. We all know frazzled is never a good look. It’s important to make sure you are caring for your whole self so that you can deal with life’s challenges and be at your best for your children. Mums need to push aside any guilt that you can’t be a good mother if you take time for yourself, even super mums need to re-group every now and again. By nurturing ourselves we are demonstrating to our kids that taking care of ourselves is important. The key to good health is a nourishing diet, exercise, plenty of rest and lots of water. Good nutrition will not only keep energy levels up, it will also ward off illness, because no mum can afford to be sick, but for those times when we do succumb, it will also aid faster recovery. First and foremost, don’t skip breakfast! Make healthy eating part of your family’s everyday life – create a meal plan to avoid bad last minute meal choices and switch to wholemeal breads, pasta and rices. Cook more than you need and freeze the leftovers for quick meals. The two fruit and five vegetable rule of thumb suits most families. However, pregnant and breastfeeding mums need to boost this up slightly to around five to seven servings of vegetables and 4 fruit each day. Water, water, water. We all know we need to drink more water, it helps improve energy, skin, digestion and weight loss. The usual recommendation is eight glasses a day, but that can depend on your size, physical activity, climate, diet and medical factors. You always pack snacks for the kids when you go out, but what about yourself? Start bringing your own fruit and a water bottle, it will help avoid take away snacks. Some mums might need a little something extra, especially breastfeeding mums, so take a multivitamin to ensure you are getting everything you need. We have all heard people say “Sleep when your baby sleeps”, and it is true, even a cat nap or lying down on the couch will help restore energy and clear your mind. Mental health is just as important as physical health. Keep connections and communications strong with friends and family and schedule time for you and your partner, it can boost your mood and your outlook on life. Not all salads are created equal. High-fat ingredients like bacon and creamy dressing may well have more calories than a steak and fries! We all know we should moisturise and use sunscreen for healthy, brighter, younger-looking skin. But no one has ever said, ‘Gee, I wonder how I can make my beauty routine longer in the morning.’ We’re all looking for ways to shave off time. The key is to prioritise and find products that double up on tasks like foundation with added sunscreen. A beauty routine doesn’t have to mean an expensive trip to the salon and organising care for the children. Get the kids involved. Older children can help do mum-mini-makeovers with nail painting, hair brushing and massages. For those with younger children, treat them to a bubble bath and use the time to be in the bathroom supervising yet also doing any necessary plucking, waxing or shaving. Trade babysitting with another mum and use the time to rejuvenate, not catch up on housework. If you don’t have a lot of time to do your makeup, reach for concealer, mascara and a lip gloss as a minimum. If you enjoy having painted nails but can’t spare enough time to let them dry, then leave your nails for two minutes and submerge in ice water for three minutes. The cold water helps polish completely dry – and we can all spare a measly five minutes. For hair, get regular trims to keep your ends healthy and your style fresh. Tell your stylist you would like a fuss-free style. This may mean you have to embrace your natural texture, no matter what it is. For those days when you don’t have time to wash your hair, try using dry shampoo – a bit of talcum powder on your scalp works just as well. As a bonus, shampooing less helps preserve hair colour. Above all, the best thing you can do for your skin and beauty will not be found in a salon, it is to make sure you get enough sleep, it is called Beauty Sleep for a reason. Premature ageing is a reality for many sun-loving Australians. Other factors that contribute to crows feet include cigarette smoke, lack of exercise, exposure to cold weather, alcohol, stress and a lack of sleep. The old saying “Those who think they have no time for exercise will sooner or later have to find time for illness,” sums up perfectly why we need to keep up physical fitness. If you wait until you find time to work it in, you’ll be waiting forever. Put exercise on your list and do it! Exercise decreases stress hormones such as cortisol and increases endorphins, adrenaline, serotonin and dopamine, the body’s natural feel good chemicals, which re-energise and revive us, so it is worth making the time. Once you get the all clear from your doctor after the birth of a baby, usually after six weeks, you can start slowly getting back into exercise. Start small with walking and pelvic lifts. Some hospitals offer post-natal exercise classes such as low impact yoga and pilates, or aqua-natal. Once you are ready to step it up a notch, you can save money by doing fitness DVDs at home. Just 10 minutes of moderate exercise is enough to improve your mood, your vigour and decrease fatigue. However, to obtain all the benefits aim for at least 30 minutes of moderate exercise every day. Some mums may find the motivation to keep fit by enrolling in group training or working out alongside other mums. Find a local pram walking group, zumba, bootcamps or Mum and Baby yoga. If the exercise that suits you best is in a gym, find a centre with crèche facilities. Why not try something a little fun and fancy like lap dancing or pole dancing lessons or joining a roller derby team? Stay at home mums lift the equivalent of nearly one tonne every day caring for their babies - based on a baby weighing 10kg picked up and put down 90 times a day. So ladies, if you don’t like the extra kilos, the black roots against blonde hair or the unibrow, then get it on the family calendar, in the budget and resist the temptation to cancel. So, a quick re-cap. Drink lots of water, eat your veggies, fight to get more (if not enough) sleep, exercise and it will all start combating stress. And when you let a few things slide, don’t worry. These tips are intended to help you find ways to feel better about yourself, so do what you can do and be proud of that. Some real mums tell Offspring their journeys and tips and tricks. Nicole Tyrie, Perth, mum to James 3 1/2 years and Chelsea 22 months. “I started the Michelle Bridges 12 week Body Transformation Challenge in February 2012. Organisation is key. I found that planning my meals and being as organised as possible helped me to feel more in control and gave minimal room for slip ups! I plan my family’s meals for each fortnight and try to shop fortnightly so there is less chance of having to pop to the shops and buy extra, unnecessary things. 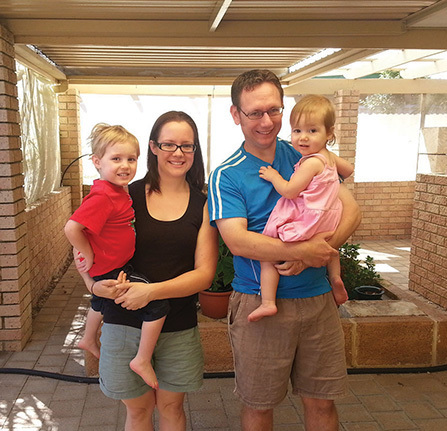 Nisha Smith, Perth, mum to Tahlia 5 years and Xavier 2 years. Lisa Brune, Sydney, mum to Archie 5 1/2years and Ruby 3 years. “I joined a gym last year which cost $17 a week. I made new friends there who taught me how to maximum results in minimum time, which was important to me with two kids at home. I discovered High Intensity Interval Training (HIIT) which changed the shape of my body, increased my confidence and it was actually fun! Plus, I knew each workout was relatively short and changed every day which kept my body guessing and my mind entertained.